I didn’t have long enough to enjoy my rustically beautiful (love the fireplace) room at Harvest Inn, but I did stay long enough to experience the breakfast. 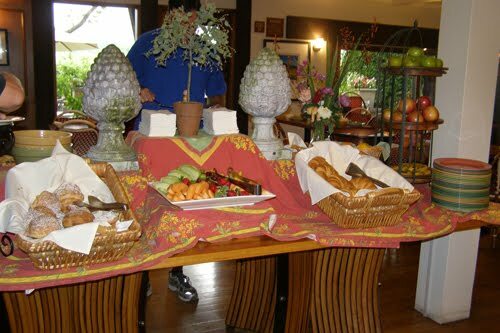 It was called a “continental breakfast,” yet I put it up there with one of the best hotel breakfasts I’ve ever had. It included pastries, scones, muffins, fruit, quiche, cheese, yogurt, ham and cereal. All were fresh and it was a tough decision to settle on yogurt, a blueberry scone and a piece of quiche. 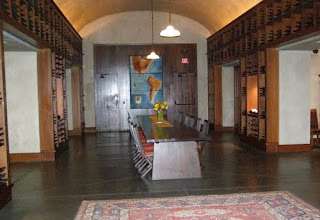 It was just as tough to check out of the room I felt like I had just gotten to, but Sterling Vineyards was on the agenda. My Pure Luxury Transportation driver Steve picked me up bright and early to head over to Calistoga for my private tour at Sterling Vineyards. My sister-in-law, Claire, was along for the day and we were escorted by Diageo’s Kim Tomlinson through the winery’s famous tram. The ride over the Napa Valley is beautiful and we were immediately greeted by Michael Westrick, Sterling’s winemaker, on the other side. He took us through the winery and we soon learned he was as well versed in history as he was in making wine. We learned about Peter Newton, who built this property on a hill (with a tram) so it would be unusual from the start. He also brought in Merlot, a shocking grape at the time, and built this winery into a place where 200,000 people per year could enjoy a self-guided tour and tasting at their own pace. 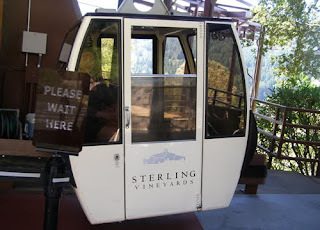 After enjoying the incredible view from the top of all of the vineyards and most of the valley, we headed to the tasting room to start with the Sterling Napa Sauvignon Blanc, which had a great taste enhanced by just a little time in old oak. From there it was the 2008 Sterling Napa Chardonnay, a buttery blend with hints of apple and pear, but not as oaky as the 2008 Sterling Reserve Chardonnay. The Sterling Napa Cabernet Sauvignon had a great nose, with some blackberry and spice, but was still a bit silky. I enjoyed the 2006 Three Palms Napa Merlot with a nice finish, but the Diamond Mountain Napa Cabernet Sauvignon is for those with much drier taste. For a classic red, I’d recommend the Sterling SVR Reserve, mostly Cabernet, with a bit of Merlot and Peter Boudreaux. I had a bit of time after Sterling to honor another Twitter invitation, this one from Cuvaison Estate Wines. We didn’t tour their winery, but instead went to one of their tasting rooms, where we started with the Estate Sauvignon Blanc, full of kiwi and citrus and a bit drier than the others I had tasted. The 2008 S Block Cuvaison Carneros Chardonnay had notes of tobacco and oak, with an interesting finish, similar to the 2008 Mariafeld Pinot Noir, but not as light. The 2007 Block FS Pinot Noir, recently featured on Top Chef, had a hint of vanilla. It is their 2007 Brandlin Cabernet Sauvignon from Mountain Veder and Napa that is a fruity blend of cherry and raisin, coming from a mix of mostly Cabernet, with some Malbec, Petit Verdot and Cabernet Franc. The last winery of the day was Franciscan, where Nolan took us through some of the vineyards and the beautifully gardened grounds before heading into the extensive wine library for our tasting. Franciscan, along with Robert Mondavi, who I visited yesterday, is part of Constellation Wines, but it hasn’t lost its rich heritage. 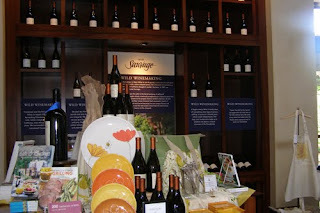 We saw bottles dating back to the 1970s and blends (like Johannesburg Riesling) that no longer exist in this area. What we tasted, however, was new and outstandingly paired with local cheeses, like the Fog Lights from Cypress Grove. The Franciscan Sauvignon Blanc is an excellent one, though medium-bodied, it was still rather refreshing. If you are looking for something a bit more smoky, the Franciscan Cuvee Savage Reserve is a good choose for a red and the 2006 Franciscan Magnificant Cabernet Sauvignon is bone-dry with the addition of Merlot, Petite Verdot and Malbec, making it a good choice with cheese or steak, but I would not have it alone. For our final stop before dinner at Bouchon in Yountville (Claire recommends the Halibut), I got to take a tour of the Wine Train. 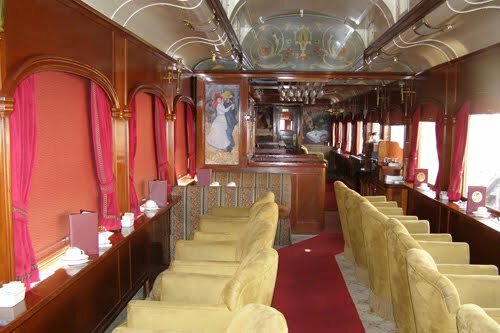 It was unfortunate that a ride didn’t fit in my schedule this trip, but a look at the itinerary, events, menu and dining cars was enough to convince me to make time for it on the next trip. Napa Valley day two ended at the Westin Verasa Napa, getting ready for a morning tasting in Rutherford of Rosenblum Cellars, and a drive to Sonoma to continue the California wine adventure.